Tastefully Fit Trimline hosted Men's Health Awareness Month in Pennsylvania and Men's Fitness and Nutrition Education Day, June 16 at the Pennsylvania State Capitol. Designed to educate, inform, and encourage new, life-changing healthy habits in men, health champions encouraged Pennsylvania men to know their numbers, make healthy food choices, and take time for routine physicals and preventive care. 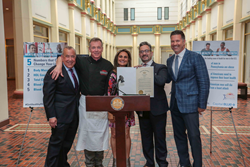 RJ Harris, Chef Wes Stepp, Nadia Sharifi, Deputy Secretary Ray Barishansky, and Senator Mike Regan join forces at the Pennsylvania State Capitol to #GetHealthyPA. Men need to be better caretakers of ourselves, get regular checkups, and do simple screenings that can help reduce our risk factors for heart attack and cancer. Nadia Sharifi and Chef Wes Stepp, co-owners of Tastefully Fit TrimLine, presented June as Men’s Health Awareness Month in Pennsylvania and June 16 as Men’s Fitness and Nutrition Education Day in the Pennsylvania State Capitol East Wing Rotunda. Fellow champions in health care and wellness joined forces for a press conference, health screenings, and wellness demonstrations. Deputy Secretary Ray Barishansky, Health Planning and Assessment, presented the Governor’s Proclamation, and Senator Mike Regan presented a Senate Resolution, both declaring a statewide commitment to men’s health awareness. Community health leaders included: Dr. Robert K. Nielsen, President, PinnacleHealth Medical Group; RJ Harris, Healthy Lifestyle Advocate and Men’s Health Champion; Dr. Mary Catherine Sneider, AllBetterCare Urgent Care Centers of Central PA, TrimLine Medical Director; Capital BlueCross, Gina McDonald MS, ACSM-EP, CPT, Senior Health Coach; and representatives from Central Pennsylvania Food Bank, The Salvation Army Harrisburg Capital City Region, and American Heart Association Central PA, and Pennsylvania Nutrition Education Network. “My journey to good health took many wrong turns, and I know the struggles men face in embracing healthy lifestyle choices. As a chef, I know good nutrition is the key to healthy living. As a father, son, and business owner, I’m compelled to take a lead in the health and wellness education conversation. Men need to be better caretakers of ourselves, get regular checkups, and do simple screenings that can help reduce our risk factors for heart attack and cancer. Our goal with Tastefully Fit TrimLine is wellness that tastes good,” says Wes Stepp, who is also owner of Red Sky Café. Tastefully Fit TrimLine was created with the combination of Nadia Sharifi’s (owner and operator of TrimLine Weight Loss Centers) expertise in food science and nutrition and Wes Stepp’s (owner of Red Sky Café) healthy cooking. Tastefully Fit TrimLine is a lifestyle change, not a diet. The program is centered on health and wellness, to create a style of living that is sustainable, and to ensure a better quality of life now and for the future without forfeiting flavor. Nadia opened TrimLine independently in May 2009 in Lemoyne, Pennsylvania. Currently there are four locations including Lemoyne, Harrisburg, York, and Lancaster. Wes has been working as a chef for over 25 years. His cuisines reflect the best of what the coast offers, always fresh and succulent. In addition to operating his restaurant, Chef Wes has a thriving catering business. For more information on Tastefully Fit TrimLine, or to learn about becoming a healthier you, visit http://www.mytrimline.com or call 717-982-7181.